Once you get past closing day, it’s smooth sailing to get into your new home, right? Well, sometimes. There is still one big hurdle when it comes to buying and settling into a new home… move-in day. 1. Declutter while you pack. As you’re preparing for your move, don’t be afraid to get rid of items that no longer fit or that you no longer use. Fewer items to move equals less work on moving day. Move-in day is sure to go more smoothly if you are organized. As you’re prepping for the big day, write down all the things you want to accomplish, from unpacking needed items to making sure the fridge is stocked with essentials. Whether you’re feeling the packing vibe or not, you’ll want to have some help once move-in day arrives. Either hire professional movers or enlist reliable family members or friends to assist as you get settled into your new home. 4. Schedule a mid-week move. If for no other reason than price, it is always a good idea to move during the middle of the week. You also probably won’t have to deal with as much traffic as you’re going from one home to another. 5. Move your important documents yourself. Of course, it is a good idea to keep your important documents in a safe. But it also is a good idea to make sure you move that safe yourself on move-in day. Why? You’ll have peace of mind that even if everything else seems to go wrong, your important information will be secure. 6. Update your billing address. Before you move, make sure to change over utility bills and update your address on any other important mail. You don’t want to miss payments because you forget to let your creditors know you’ve moved. 7. Give out your new address. If you’re updating your contact information for creditors, it only makes sense that you also would update your contact list for friends and family members too. Be sure you let your loved ones know how to find you. 8. Let each family member pack a box of must-haves. Moving can be difficult for every member of the family. Help ease the transition by letting each family member pack a box of things they can keep with them. When you do this, things like your children’s favorite blankets and toys are sure not to get lost in the move. 9. Don’t forget a family “must-have” box. Your family members won’t want to be without their favorite things. Don’t let them be without the things they’ll need to get through one night too. Include items like toothbrushes, contact solution and anything else you and your family members simply cannot do without for one night. It may seem like a no-brainer to label your boxes. But take that organization one step further to ensure a smooth move-in day. Use colored tape to label your boxes. Movers will be able to easily identify which boxes belong together, so you’ll have an easier time organizing things as you’re getting settled. At the end of a long moving day, there is nothing worse than scrambling to find your sheets, so that you can go to bed and get a good night’s rest. Clearly, mark your bedding and make it a priority for everyone to be able to sleep in their own bed on move-in day. 12. Throw an unpacking party. If friends or family members want to help you get settled in, welcome the help! Order some pizza and let the group unpacking efforts get underway. This way, your loved ones will be able to see your new home, and you’ll be able to oversee multiple rooms instead of focusing your efforts on just one area at a time. 13. Introduce yourself to neighbors. You may not remember the names of everyone you meet in your new neighborhood on move-in day. But try to say hello to neighbors you see out and about as you’re getting settled. On move-in day, you might find that you need extra cleaning supplies or even just a few extra snacks. Instead of searching for places to find supplies while you’re trying to get unpacked, be sure you know the locations of a few shops and restaurants around your new home. Of course, this tip is easier said than done. 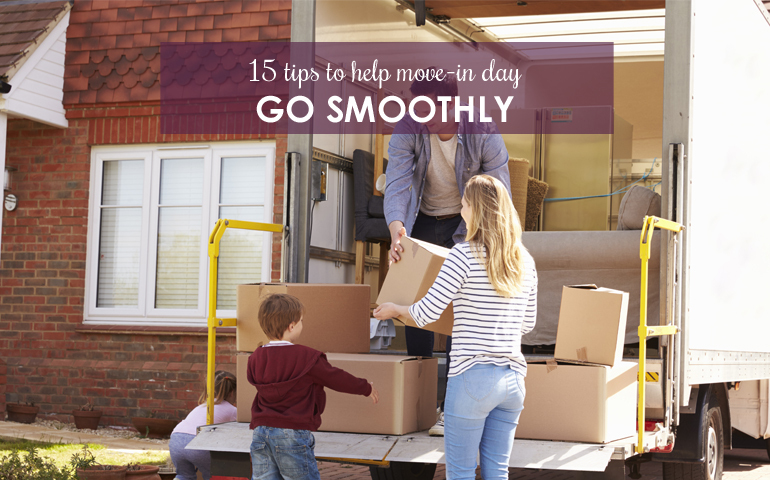 But try to remain calm on move-in day and as you’re getting settled into your new home. It is OK to admit that not everything is going to get done at once. Instead of worrying about getting everything in order right away, take time to enjoy your new home!